Even before she sent me her wedding photos, I knew I was gonna have to squeeze a dress post out of Celia. 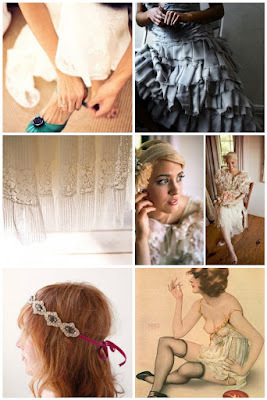 A girl with vintage style who commissions a custom wedding dress? Yes pls. I decided to have my dress custom made pretty early in the dress decision process. I had quickly considered jumping on the bandwagon and buying some fancy designer dress but as soon as I saw some of those fancy designer price tags, I was instantly turned off. My mom was gracious enough to tell me that she would work with me on the price, but honestly, spending THOUSANDS of dollars on a gown that could probably be seen on the pages of most wedding magazines and could be worn by any girl that was ready and willing to spend those THOUSANDS of dollars, seemed 1. predictable and 2. not me at all. I try not to buy my regular clothes from massive corporations, so why would I go that route when it came to my wedding day? On to plan B: a vintage dress!! This idea was extremely appealing. I own and wear tons of vintage and one of my best friends is a vintage buyer. This was going to be perfect! Well, turns out, not so perfect after all. 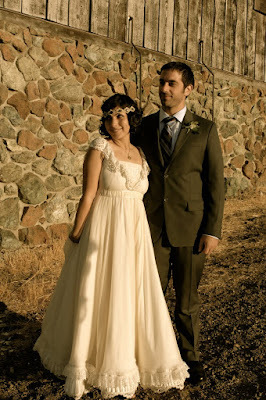 I have seen many girls pull off vintage wedding dresses beautifully, but unfortunately, I was not going to be one of those girls. I tried on a slew of vintage gowns, but I always ended up looking too kitschy and not classic, which is what I really wanted. After all the excitement, I was a bit heart broken that vintage wasn't going to work for me. And that's when I made the decision to have my dress custom made. I knew it was the only way to get the dress I actually wanted... the dress of my dreams! The hardest part was finding someone reputable that I felt I could totally and completely trust. 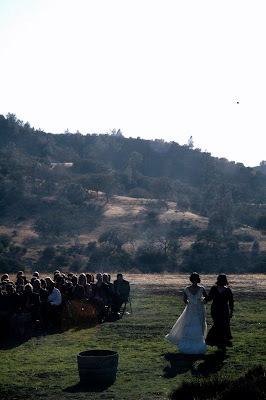 I came across Lindsey Nelson (who's worked for the Los Angeles Opera House) through another dressmaker who had made wedding dresses for two of my friends, but had moved to Nashville. I didn't know exactly what I wanted, but I definitely knew what I didn't want (no strapless/mermaid/satin/beaded ensemble) and I knew the look I was going for. I sent her photos of dresses and details that I loved and asked her if she would be interested in making my dress. Lucky for me, she jumped on board and said that she would come to my home for all our meetings and fittings. So, I basically got a badass wedding dress without ever having to leave my house... that's my kind of business deal! She came by a few weeks later, measured me, asked me a whole bunch of questions, brought more pictures for more inspiration, and sketched out what I knew was going to be the most gorgeous dress. I was definitely set on lots of lace and unlike esb, I AM a ruffle person, so there was going to be some serious ruffle action. Knowing that I had loved the idea of a vintage gown, Lindsey had suggested we use vintage lace to construct all the ruffles on my dress. GENIUS! I'm pretty sure that was the very moment I fell in love with her! Over then next three months, we took a trip downtown to pick out the fabric for the main part of my dress, we bid on a variety of vintage laces that Lindsey found for me on Ebay, and had four fittings total. Everything went so smoothly and perfectly, that I even asked her to make my mom's dress and a blouse for the flower girl. In the end, I couldn't have asked for a more beautiful gown on my wedding day and I definitely couldn't have asked for a better, sweeter and more personal way to get that dress. There's no way I would change a thing. as soon as I saw her wedding on your last post the first thing that came to mind was- WHERE DID SHE GET THAT DRESS!? The link for "Lindsey Nelson" doesn't work. Does she have a website or anything? Gasp, lace loveliness. Thanks for sharing! where do you get such effing gorgeous brides? Awesome, I love the detail on the top of her dress. Oh Celia you are far too fabulous!